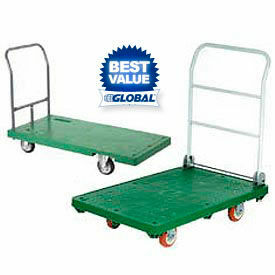 Plastic Deck Platform Trucks are available in various Dimensional Sizes, Load Capacities and Configurations. 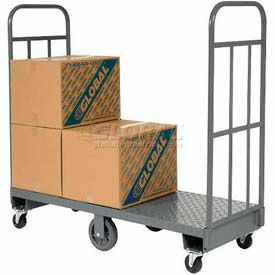 Plastic Deck Platform Trucks are solidly constructed for long lasting strength, durability and dependability. Non-skid, structural foam plastic deck is resistant to rust, chemicals, dents and temperature fluctuations. Stands up to harsh weather conditions and cleans easily. Enamel coated handles withstand varying climates and have easy-grab soft surface. 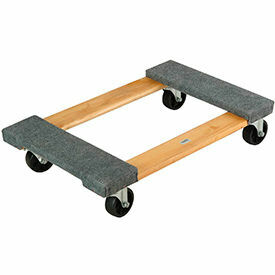 Available wheel types are Mold-on Rubber, Polyurethane and Rubber. Handle styles are Fixed, Removable, Removable & Stowable and Folding. 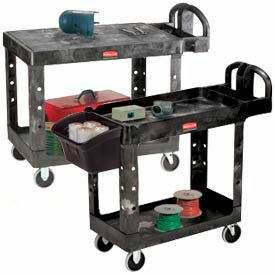 Maneuver easily on 2 swivel, 2 rigid casters that are 4, 5, 6, and 8 inch diameters. Load capacities range from 265 - 2500 lbs. Other dimensions vary per model.